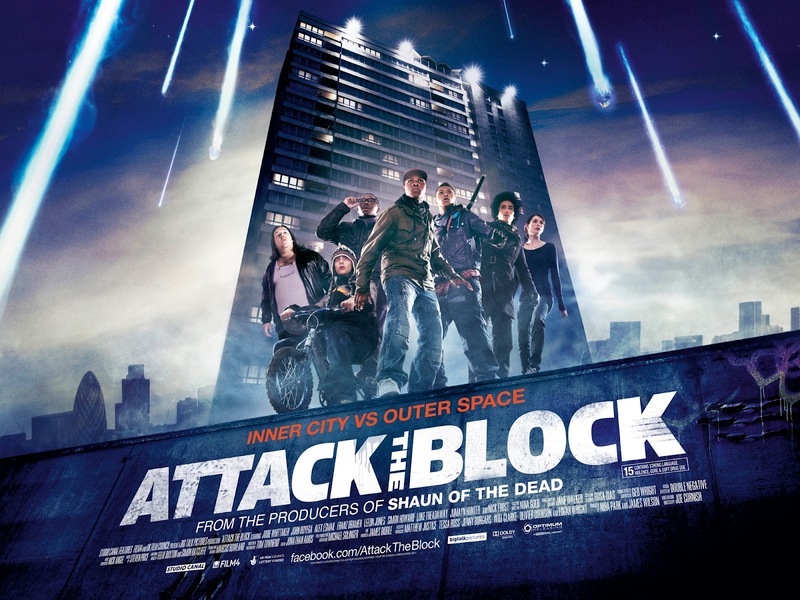 Shaun Of The Dead, Hot Fuzz and Scott Pilgrim Vs The World are three other films from Edgar Wright, executive producer of "Attack The Block". All three achieved near critical acclaim, and I really like two of them (Scott Pilgrim and Hot Fuzz). All three are full of fine performances, drama and, of course, comedy. All three are also of different genres; Shaun of the Dead takes on the Zom-Com genre, Hot Fuzz is a buddy cop flick, and Scott Pilgrim is pretty much a video game film. However, Edgar Wright is not the director here, but the executive producer. So who knows if his talent can shine through, and make "Attack The Block" a success, blud. "Attack The Block" follows a gang. They have just mugged a woman (Jodie Whittaker) when the car next to them is destroyed under a falling meteorite. After investigating it, they are attacked by an alien. They run back to the block, but more and more of the aliens are coming down. They only seem to be after the gang's leader, Moses (John Boyega), but they are killing everyone in their way. With another gang leader out to get them as well, can the gang survive against this deadly alien invasion, trust? Well, "Attack The Block" is NOT your ordinary alien invasion movie. To start with, it's absolutely hilarious. It really, really is. I'll be honest, I was so hyped with this film, and the reviews had been so surprisingly good for it, I expected it to be a letdown. It wasn't. What I received was an action packed sci-fi flick, packed with blood, scares and tremendous laughs. Here's the run down, bruv. I'll start with the comedy aspect of it. "Attack The Block" is easily the funniest new release I've seen since Scott Pilgrim, and it may possibly be funnier than that. There's a solid laugh every couple of minutes. And, thankfully, the jokes don't all rely on the slang, there are more than a handful of good, smartly written gags that are just as effective. But, of course, the slang is funny in itself. Well, it starts hilarious, slowly gets tedious, and finishes a tad annoying, but that's the only negativity I can give, believe. spoil it, and it made for a satisfying final act, and tings. The actual species design on the creatures was very impressive. The aliens are solid black, as in the sky at night black, or as one character says in the film "blacker than [his] cousin". The only thing that you can see of them is their fluorescent green teeth, which make for a great eerie effect. The one female on the film is king of similar to the aliens from the Alien series, but smaller and more of a browny/white colour. Overall, they were very well designed, and made the film pretty darned creepy, mandem. The acting was OK, I found. Jodie Whittaker as Sam, the woman, was fairly good. She portrayed the "scared one" well, and was believable. Nick Frost was good, although he wasn't in it much, he was just for publicity and marketing I feel. The whole gang were OK, a few weak links, and the other gang members were not very good at all. However, the stand-out performance of the film goes to Alex Esmail, who played Pest. This is his first film, but he was brilliant. Funny, well acted, he gave the film its charm. The acting was the film's weakest element, but I wasn't expected much of it anyway. I'm just glad it didn't drag the whole film down with it, cos what a shame that would've been, init. To Summarise: Scary, funny and damn right entertaining, "Attack The Block" marks an incredibly strong directorial debut for Joe Cornish.